This softly fluted cami silhouette offers a tattoo inspired French Leavers lace insert in noir and black silk satin bindings. Contrasting with the bold Ultra Blue Peony print. Adjustable straps and gold trims elevate this timeless piece seamlessly from loungewear to daywear. A beautiful representation of pure luxury loungewear, 100% Silk Slip in an original 'Indigo Fern' print '. The delicate ladder trim detail offers a modern twist for a ready to wear piece. These beautiful bold print silk pyjama trousers are the perfect companion to the coordinating shirt. With a smoothing flat front, side pockets and a wide, straight leg this relaxed style is the ultimate in sophisticated comfort loungewear and easily transcends to a cool daywear vibe, just team with a crisp white shirt! 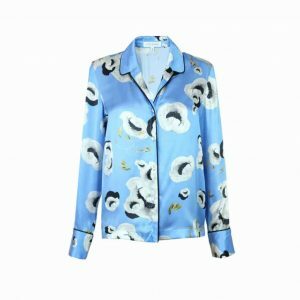 This stunning contemporary Pyjama Shirt is a wardrobe staple with a bold and beautiful, Ultra Blue Peony print. contrasted with jet black silk satin piping giving it a modern twist. The slim revere collar and sleeve, and lower neckline transcends it from luxury loungewear to an instant ready to wear wardrobe item. This deep navy and ivory Regency Stripe short is the perfect partner teamed with the regency silk Cami. They offer a soft elasticated style with navy silk edging to elevate the sports luxe feel. This stunning regency stripe A-line silk cami is updated with a delicate, tattoo inspired French Leavers lace insert in black and features navy silk satin bindings. Adjustable straps with gold trims and a softly fluted hem. Team with the Regency Stripe shorts or Pyjama pants, or as a ready to wear item for that chic summer vibe. This Regency stripe silk pyjama top is easily adaptable from sleepwear to a ready to wear item with its low neckline and slim revere collar and sleeve. Navy silk piping through the collar edge and mother of pearl buttons gives it a sophisticated yet masculine edge. La Sporty Sirene Bikini Brief is overlaid with elegant crochet detail with tie sides. Team with the matching 'La Sporty Sirene' Bikini top and Beach cover up to complete the look. La Sporty Sirene Bikini Brief is overlaid with elegant crochet detail. The bottom offers good coverage at the back with a wide side tie detail for a flattering coverage across the hips. Team with the matching 'La Sporty Sirene' Bikini top and Beach cover up to complete the look. La Sporty Sirene Bikini Brief is overlaid with elegant crochet detail. The bottom offers good coverage at the back and a fold over waistband for that extra flattering silhouette.